We finally made it. 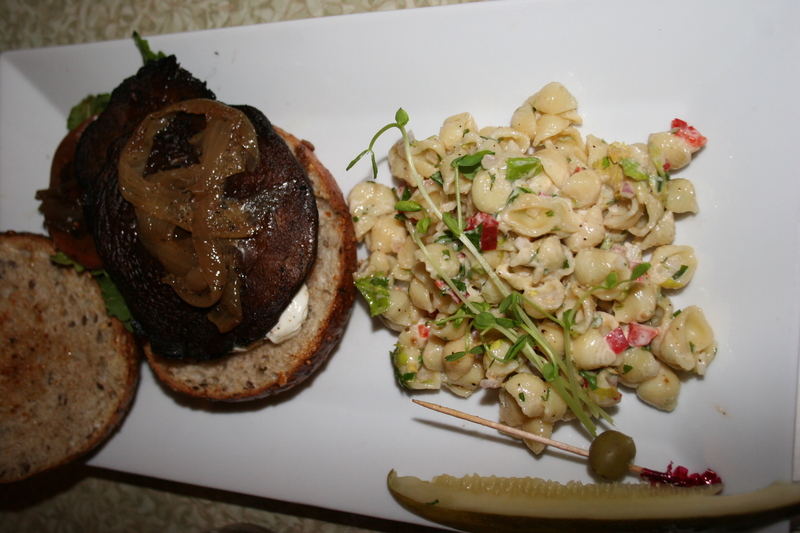 After reading F Scott and Zelda’s reviews and spending countless hours drooling about the menu, our group of eight hungry diners converged on the Collingswood eatery, the second “label” for renown Chef Alex Capasso of Blackbird fame. It may be difficult to secure reservations at Blackbird on a Friday or Saturday evening. 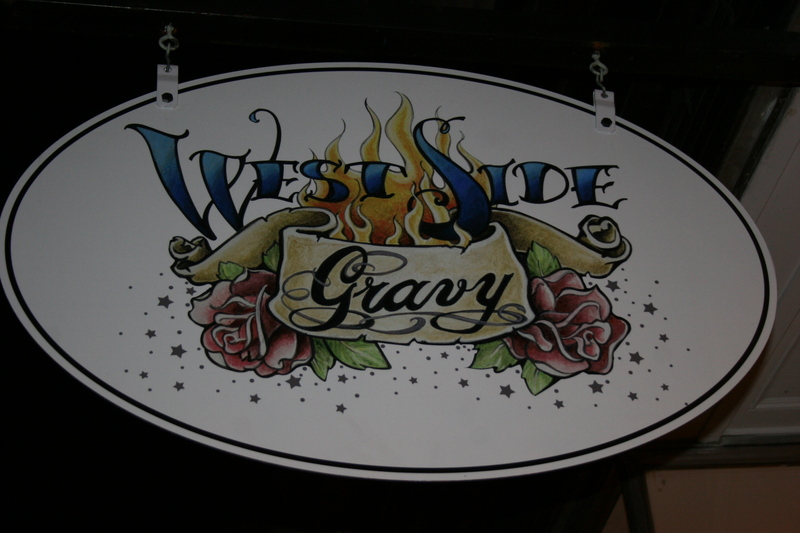 It will not be difficult to get a table at West Side Gravy on those same nights. In a way, that’s a shame. Let’s begin by explaining what West Side Gravy is NOT. It is not a full service, fine dining restaurant. That’s what Blackbird, Nunzio’s, Il Fiore, Casona and a host of other Collingswood restaurants are. West Side Gravy is a fun place for some interesting and well-prepared comfort food, served by some very nice people at reasonable prices. Our server, Allie, was one of those very nice people and she made us feel comfortable from the very beginning. She was attentive and charming and after opening our wines and puzzling over why we open four bottles and none of us share with each other (a story for another day), she recited the evening “specials” from every category on the menu. We pointed out to Allie, that first time diners at West Side Gravy should not be entitled to evening “specials” as there is plenty to choose from on the regular menu. My wine for the evening was something that was recommended by Charlie Beatty at Canals BottleStop in Marlton. 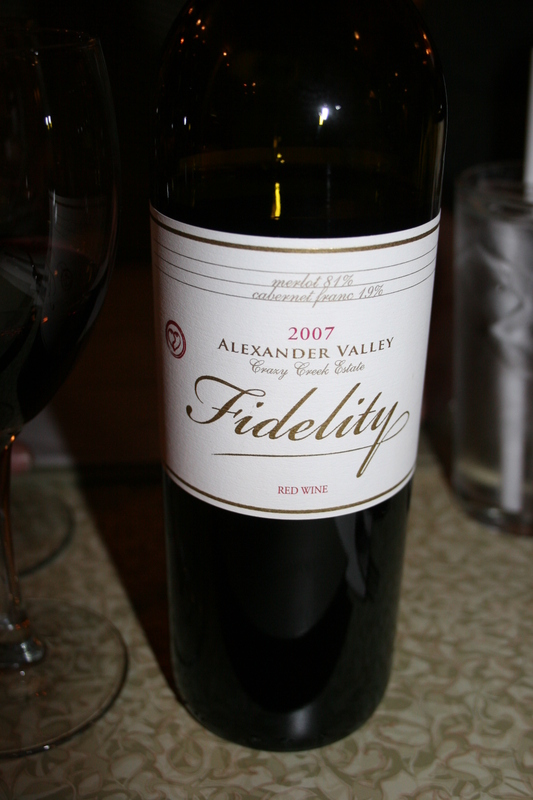 The 2007 Fidelity, Alexander Valley, Crazy Creek Estate, Red Wine was a nice blend of 81% Merlot and 19% Cab Franc. Both my wife, Kathy, and I thought it was excellent with the cab franc giving a little bite to the softer merlot. It’s not a fruit bomb it’s just filled with nice cherry and chocolate flavors and at about $15.00 this one drinks like a wine at 3 times it’s cost. Tom and Barbara T. had just returned from a vacation in WIlliamsburg, VA and they had with them a wine they wanted me to try. I agreed and was prepared to try and find nice words to express my dislike for virtually any U. S. wines from outside of California, Oregon or Washington State. 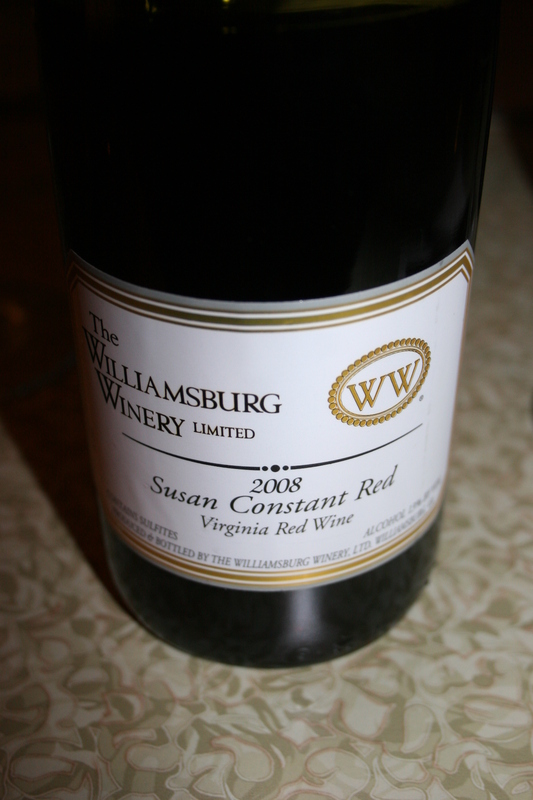 However, this one, 2008 Williamsburg Winery Susan Constant Red Wine wasn’t bad. It wasn’t very complex but the taste was pretty good with some nice fruit flavors and a soft mouthfeel. Unlike other local wineries who charge big bucks for their wines, this one is under $10.00. We all had a hard time making our selections but the guys decided to split a couple of appetizers. 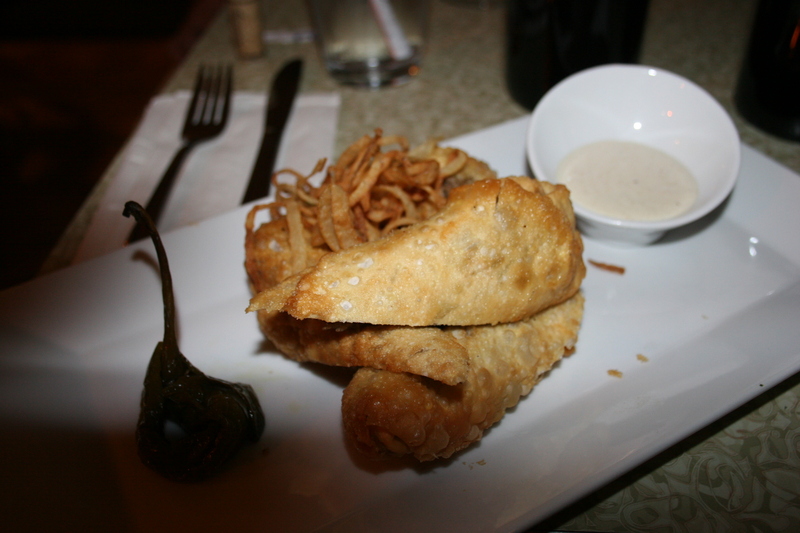 We split the West Side Fries with Pinot Noir gravy and the Cheesesteak Eggrolls. The fries were nicely done with a portion size that would be fine for two people. 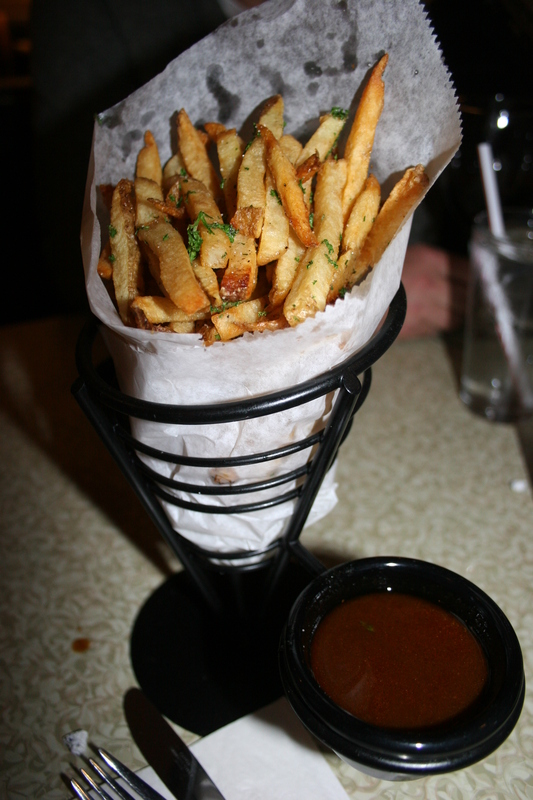 The gravy was great but I should have poured it on my fries instead of dipping each one. The cheesesteak eggrolls were really good. There were four nice sized pieces so we each had one for ourselves. Four of them would almost make a meal and they came with a tasty horseradish sauce for dipping..
A couple of folks ordered the Sweet Potato Soup which they voted OK…but nothing special. The Fried Green Tomatoes were also seen as having too much breading. 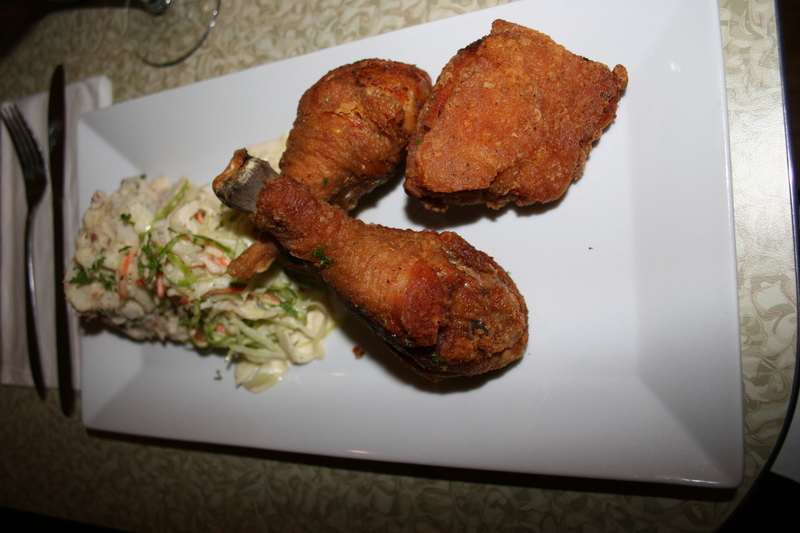 Gerry B. and my wife both went for the Buttermilk Fried Chicken, potato salad with smoked bacon dressing and house-made cole slaw. Kathy asked them if she could have all white meat and they complied with her request. Both thought the chicken was tasty and the potato salad and cole slaw were good. 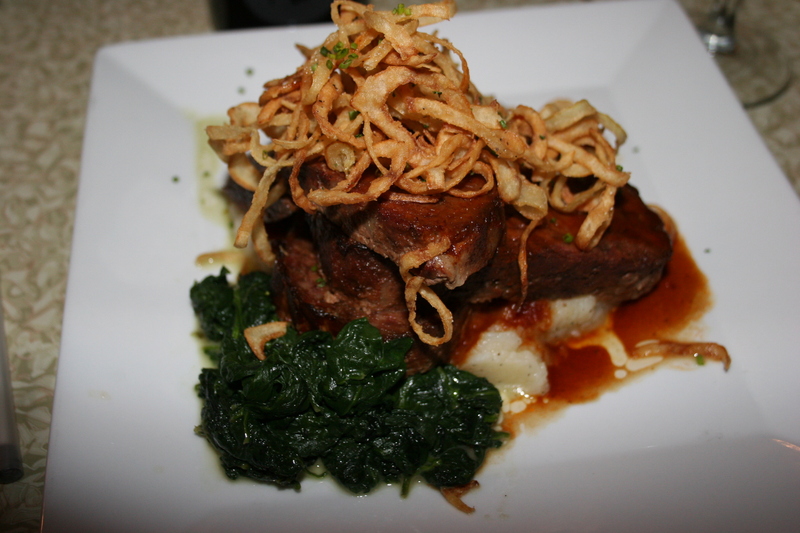 Joe and Carol both had one of the “specials”, the braised short ribs with mashed potatoes and baby spinach. 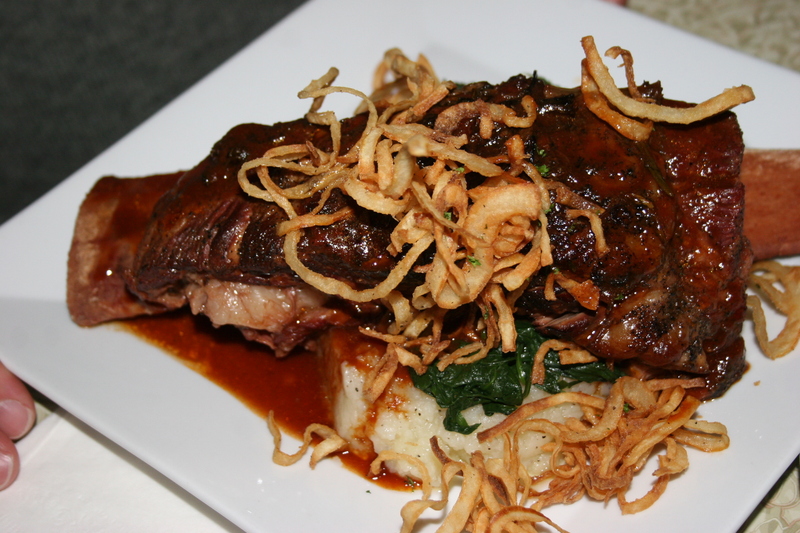 The dish was topped with crispy onion rings and a nice gravy and both enjoyed it. I always have a hard time staying away from any meatloaf dish I see on a menu and this time was no exception. This one came served over creamy mashed potatoes and I had them replace the peas with the baby spinach. Three generous slices of excellent house recipe meat loaf was topped with the delicious West Side Gravy. I was happy with my choice. 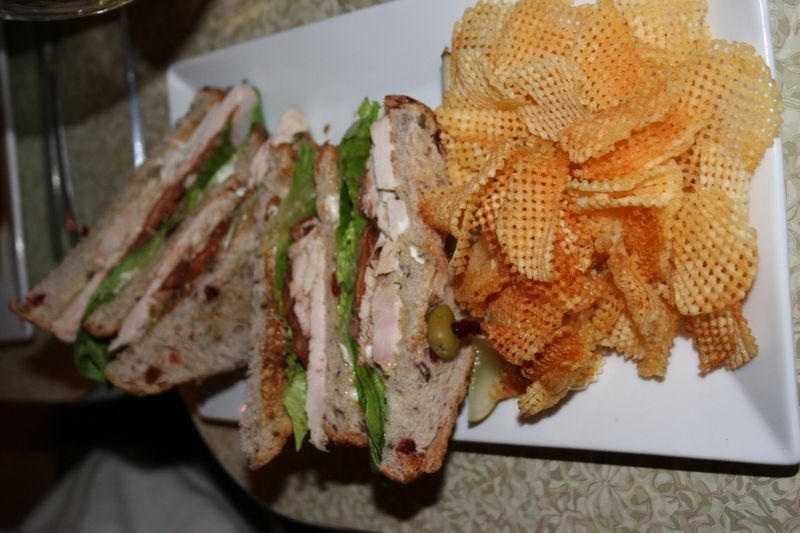 Barbara had the West Side Club, house-roasted turkey breast, smoked bacon, lettuce, marinated tomato, herb mayo on cranberry-pecan bread and served with house-made waffle chips. Barb liked her sandwich but she loved her waffle chips, We all sampled them and agreed they were very good. 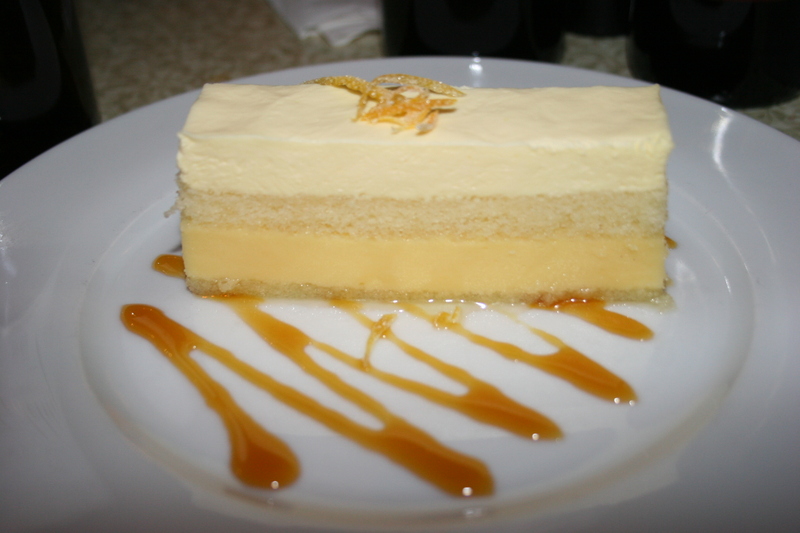 We had pretty much eaten as much as we could when Allie began to tempt us with offerings from the dessert menu. We gave in and decided we would split two items between the eight of us when all of a sudden, a bevy of desserts appears, many compliments of Alex and Siobhan, the two talented chefs who both stopped by to say “hi”. This was a very nice gesture and we all got to try several of their creations. 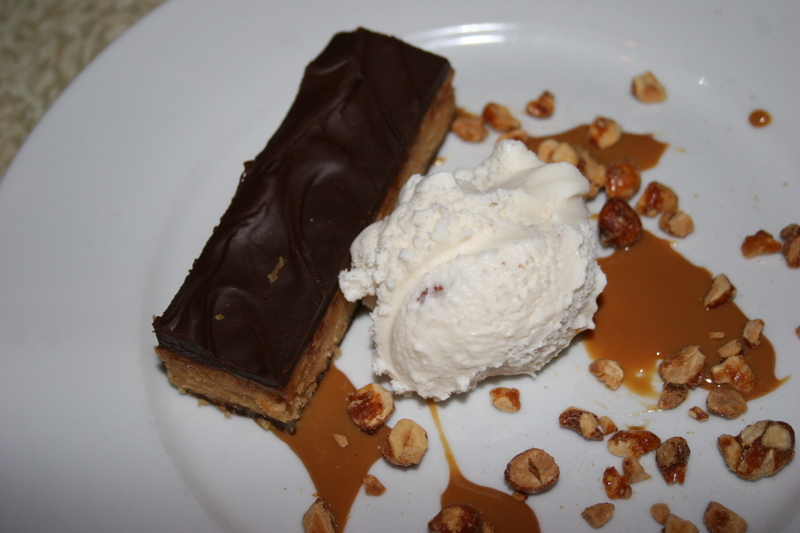 I don’t have a copy of the dessert menu so I can only accurately describe the one I spent the most time getting totally familiar with and that would be the “Snickers” dish above which was sinfully delicious. 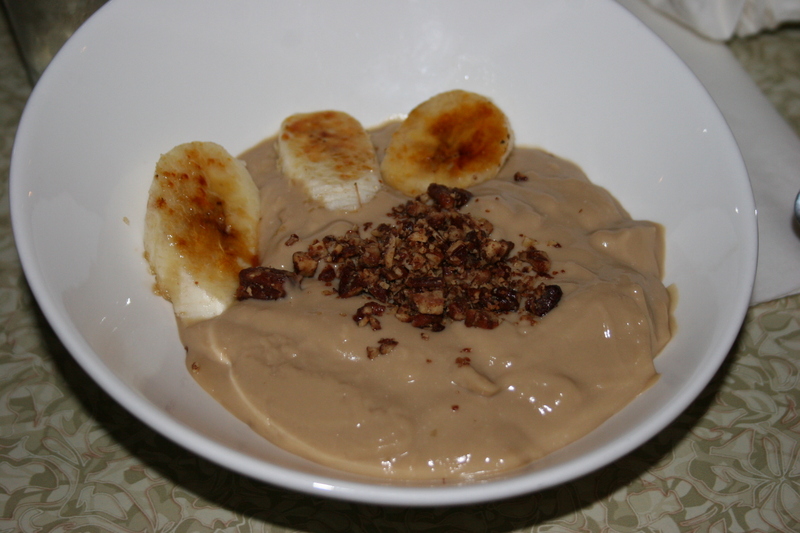 Allie’s favorite, the butterscotch pudding with caramelized bananas also drew a lot of compliments from our group. 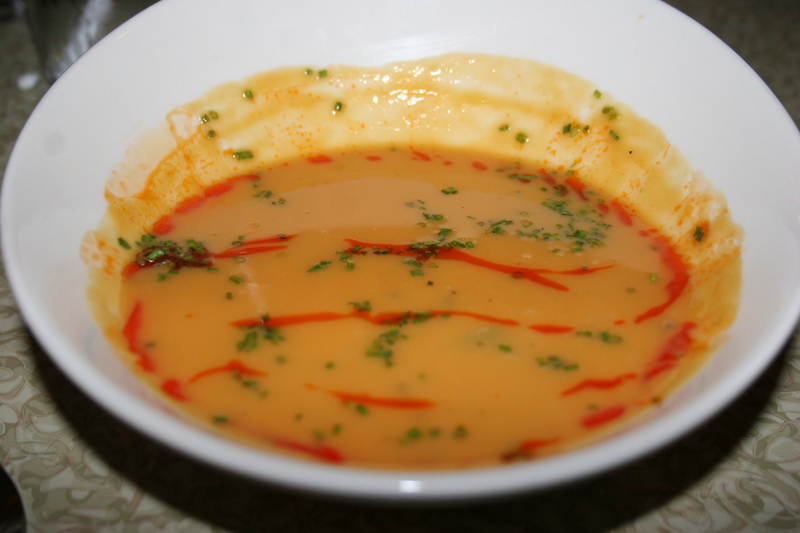 In writing this review, and even prior to our first visit, I had read a lot about West Side Gravy. Almost every article and blog post I have seen mentions the same bewildering fact. There is a distinct lack of patronage on most nights. I am at a total loss as to why that is. A few theories I might offer would be, having dined at Blackfish patrons are expecting a similar meal. It’s not that kind of place. It could be that the place is a little too big for what they are doing. Most of the restaurants in Collingswood are fairly small and tables are crammed together. West Side Gravy is in the old Woolworths 5 & 10 Building and it is cavernous. If they were just opening I could understand the sparse crowds but it’s been a few months now and the reviews are good and they certainly deserve a better fate. Personally, I think this type of dining has a place in a town with so many eating choices. At the very least, you should give it a try. The food is good and the prices are even better. I’m not sure the exact date of the opening of Wine Works in Marlton, NJ; I know it was sometime prior to the start of summer. I had been meaning to get up there and although I had made a couple of trips to Canal’s BottleStop during that time, one thing or another (maybe I can blame tremendous road construction in the area) had kept me away. Last week, I finally made my first visit. There was an element of surprise upon entering when the first face I saw was not Max or Felipe, but Vladi, my wine guy from Hops n Grapes. He had not been there long but explained that he was happy to be a part of WineWorks and hoped to do his part in making the place a success. 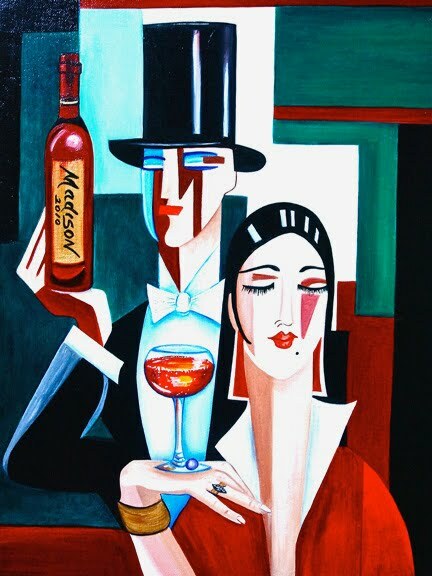 Vladi is one of the good guys in the business, he knows wines and offers personable and helpful suggestions. WineWorks is the new venture for Max and Felipe Cammarota owners of Terra Nova Restaurant in Sewell and the Landmark Americana in Glassboro, NJ, who sold there very successful, Hops n Grapes store in Glassboro, NJ at the end of last year. Their new location in the old Two Guys Shopping Center on Route 70 in Marlton, NJ faces a host of challenges which will keep them busy as they strive to make in-roads in an area ripe with competition. Perhaps their biggest challenge is that they are within a stones throw of Canal’s BottleStop. There is another Canal’s not far away on Rt. 73 and a host of other wine outlets sprinkled along Rt. 70. If it were not for the presence of Canal’s BottleStop, I would say they would have an excellent chance of leaving all the others in the dust. A walk around the store reveals a nice selection of wines with very competitive prices. They had several items that I have not seen available elsewhere and that is something I am always on the lookout for whenever I visit a wine store. It looks like they are targeting some of the items that are the daily e-mail specials for Canal’s BottleStop and trying to go under them. It would seem consumers can benefit from any price war that takes place in the coming months. Long term though, they have their work cut out for them. The selection and service at Canal’s BottleStop, under the leadership of Charlie Beatty, will be tough to top. Wine Works offers some modern features such as their “Taste The Harvest”, a selection of approximately twenty wines available in one ounce pours thru use of their “Enocard”. If you go to their website to find out how to get an “Enocard” or how much it costs, good luck. As far as I can tell, and I spent way too much time trying to find out, there is nothing there that gives you this information. In fact, their website needs quite a bit of work. The link for “BROWSE WINES”, which I foolishly thought would show me their wine selections in-depth, actually shows four wines. They are the same four wines shown on another link that purports to tell you how to match wines with food, but does not. Come on guys, I know there is a lot to do in opening a new store of this size but I would think the website has to be right up there in importance. They offer a large selection of artisan cheese and fine cigars. 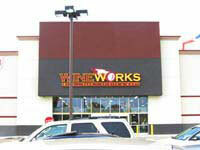 Wine Works is a nice looking store in a very competitive area and I wish Max and Felipe the best of luck. The Borsao is made from 80% Garnacha and 20% Tempranillo and is rated 89 Points by Wine Spectator. The Este Almanzora is a blend of 6 grapes and comes from Spain, as does the Borsao, the two primary grapes being 45% Monastrell and 25 % Tempranillo, and is rated 90 points by The Wine Advocate. The Marquis-Philips “Sarah’s Blend” is from Australia and composed of 63% Shiraz and 26% Cabernet with a splash of Merlot and Cab Franc and is rated 91 points by The Wine Advocate. Three terrific wines at a very affordable price. Stop reading NOW and head on over to Canal’s BottleStop in Marlton before the prices increase. I can’t think of a better way to spend one hundred dollars!! A Canal’s by any other name is not necessarily a Canal’s. There are not many places in South Jersey where people live that you wouldn’t find a Canal’s within five or six miles. The problem is all Canal’s are not created equal. You might even say that no two Canal’s are alike when it comes to wine. Some have excellent selections with knowledgeable help and others have a very boring selection with staff who are lacking in wine savvy. Despite the disparity, I am certain that the many outlets doing business under the names Canal’s Discount Liquor Outlets and Joe Canal’s do the majority of the wine business in South Jersey. Two of those locations make my Top Five South Jersey Wine Shops. Here are my 5 Favorites and 2 that receive Honorable Mention. One caveat before I announce my choices. There are some locations that I am just not familiar with for one reason or another and it is entirely possible that I am excluding some very good places. All of these stores are simply my own personal opinion. Total is a national mega wine super-store with over 8000 wine selections in each location. Founded in 1991 by brothers, David and Robert Trone, Total has grown each year and now have multiple locations in 8 states. There are several things I like about shopping at Total Wines. Their staff is very knowledgeable and often are taken on trips to various wine regions of the world where they get to sample lots of different wines. Each store contains selections that are titled “staff favorites” and although there is freedom to shop on your own there is also a staff member nearby to offer advice. Additionally, they have on hand in each store the Total Guide to Wine which has over 450 pages of information on wines and wine regions. Admittedly, this big, glossy guide becomes an advertisement for the particular wines that are stocked at Total but, hey, it’s free, it’s informative and you can’t blame them for pushing their own brands. That brings us to my one major complaint about Total Wines; they really DO push their own brands. Even though there are over 8000 different wines there are a lot of popular, good wines from all regions that are not on the shelves at Total. The average buyer will have no trouble finding something of interest and you can totally trust the staff selections. A true “wine geek” could spend hours strolling the aisles of this, my #5 favorite wine shop. The directions to Moore Brothers posted on their web site has a caveat that says “your GPS will NOT find us”. They are located just off Route 130 North on Cooper River Park Drive and they are worth finding. Years ago, when my love of wine was in it’s infancy and I was reading all I could and visiting wine stores to peruse the shelves I had reached a point where I felt I was familiar with the names of 90% of the worlds wines, even if I hadn’t tasted a large percentage of them. Every once in awhile in my reading or in conversations with others I would hear the name “Moore Brothers”. One day I came across a list of the wines they carry in their store. Unlike Total Wines and their 8000 choices, Moore Brothers only carried a couple hundred and very few were from California. None were from my then favorite region, Australia. I was perplexed. Reading thru the list I don’t think there were 3 names of wineries that I was familiar with at the time. I thought to myself, why even bother checking this place out when I don’t have the time to try the thousands of wines I am already familiar with but have not yet tasted and, why would a wine store decide to carry brands that no one has heard of? Founded by David and Greg Moore, Moore Brothers now has two other locations outside of NJ. These are located in Delaware and New York City. Their philosophy on wine explains their selections. They stock only wine from small growers primarily in France, Italy and Germany. They develop relationships with the growers, visit their farms, almost become a part of their families. They have a tremendous respect for the grapes and the people who grow them. All of their wines are shipped at 56 degrees and the store temperature is kept at 56 degrees. You will see the staff wearing jackets on the warmest of summer days. The staff is totally knowledgeable on all of the wines they carry and are extremely helpful. They are even apprehensive about you driving home with a case of wine on a hot, August day. They caution you to go straight home and get the wine back to 56 degrees as quickly as possible. It’s like you are taking one of their children on a journey and they fear for their safety. I have never been disappointed by a purchase at Moore Brothers and you should definitely make a visit to the Pennsauken location. Their website is fun and informative, too. Moore Brothers are my #4 favorite wine shop. If I never worked in Atlantic City I would have missed the opportunity of having discovered this excellent wine store. It’s a good distance from my home in Washington Twp., NJ but not far off the Black Horse Pike in Egg Harbor Township. It made my list of favorites because it has a wonderful selection of wines from every region. The prices are about the same as others perhaps a little higher as some shore liquor outlets tend to do. The other nice thing about this Joe Canal’s is they have one of the best Pinot Noir selections I have found. They also feature some better high end cabs, lots of Spanish wines and a nice selection of Australian bottles. The shelfs are a little tight and crowded but they cram a lot of interesting wines into the space they have. It’s easy to spend hours strolling the aisles of this location on Fire Road in Egg Harbor Township. It may even be that this was where I first discovered the 2001 Shirvington Shiraz which is still the best bottle of wine I have ever experienced. Those are just some of the reasons that this is my #3 favorite wine store in South Jersey. Hops n Grapes is the “new kid on the block” when it comes to South Jersey wine stores. In less than two years this Glassboro location has become my “go to” store for most purchases. It took only a visit or two to put it’s two closest wine neighbors, Canal’s in Williamstown and Monster Beverage in Glassboro far behind them. Max and Filipe Cammorata, owners of Terra Nova Restaurant in Glassboro and several Landmark Americana Tap and Grills located just off the Rowan University campus, West Chester, and coming soon to the Drexel campus in Philly have done a great job in quickly making Hops n Grapes a wonderful location for buying wine. The shop features a coffee bar with fresh pastries, an excellent selection of cheeses from all over the globe and a fine selection of premium cigars. They feature wine tastings with cheese samplings every Friday evening and the store is stocked with over 2000 selections; many of them wines you won’t find in most stores. Their premium wine case is an absolute treasure with everything from the extremely hard to find Sine Que Non wines to $1000 Burgundies. Wine “geeks” such as myself have been known to salivate on the glass while gawking at these prize wines. The staff is extremely knowledgeable and helpful and for those on a limited wine budget they even have a section with quite a few wines titled, “GOOD WINES UNDER $10.00”. Max and Filipe do a Youtube video each week on their “FIFTEEN WINES of SUMMER”. They may not yet be ready to take their comedy show on the road but I am not going to deduct any points for that. I will deduct a few points for their “wine loft” on the second floor. It was scheduled to be an area for single vineyard and exclusive wines but it just hasn’t panned out and many of the wines up there are simply repeats of those on the main floor. I am being picky though in this minor criticism. There is much to like about Hops and Grapes and “frequent wine buyers” earn a 2% credit toward future purchases. Overall, it’s a no-brainer in making Hops n Grapes my #2 favorite wine shop in South Jersey. Charlie has packed the shelves of this store with perhaps the finest selection of California wines in all of South Jersey. He has developed relationships with distributors that enable him to get wines that others will never see. He has tasted almost every wine he sells and when he steers you toward a particular selection you can be assured it’s a wine you will enjoy. The prices are consistent with other stores in the area but he offers some excellent discounts for large purchases and publishes a monthly newsletter that has over 300 sale items from all wine regions. It’s not unusual to be in the store and see 5 or 6 people all waiting to speak to Charley. It’s a minor miracle that he is able to take care of everyone when he is constantly in such demand. It’s the place I go for those special wines and that special wine wisdom that Charlie Beatty is blessed with. He is the reason that Canal’s Bottlestop, Marlton, NJ is my #1 Favorite Wine Store in South Jersey. Circle Liquors, Somers Point, NJ for fine selection and a knowledgeable staff and some nice prices for their Circle Club members and…..
Canals Discount Liquors, Hainesport, NJ this one is a little too far from my house but they have a good selection of all wines and perhaps the absolute best selection of German wines this side of Munich!